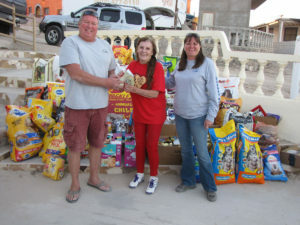 The annual Big Wave Dave’s Chili Cook-off benefitting the Animal Adoption Center of Rocky Point (http://www.rpaac.org/) will take place on November 26th In Cholla Bay. All proceeds from this event go directly to Nancy Phelan to help prepare these animals for their new permanent homes. This is a fun event with great chili to taste and lots of raffle prizes to win. If you are in town Thanksgiving weekend please stop by and show your support for the animals of Rocky Point. The chili cook-off will take place on Saturday, November 26th at the club house in Cholla Bay. Cooking time will start at 11:00 and will finish up at 2:00. The judging and tasting for the public will start at 2:30. The entry fee for the cookers is a big bag of dog food that will be donated to the shelter. Please feel free to donate dog or cat food even if you are not cooking. After the tasting and judging we will start the raffle where there is always great prizes to win. What makes this raffle so great is all the prizes that are donated are from businesses and people like you who care about animals. If you have or know of a business that would like to donate to this event then by all means please let them know about it. Otherwise great items for the raffle can be found on clearance at many stores that are trying to move out their summer inventory. Tasting for this event is always free but we do encourage you to buy raffle tickets, drop off pet food or supplies or to just donate a little something for the animals. This is a byob event so bring your favorite beverage to cleanse your palate between tastings. This is a fun (not too serious) chili cook-off. If you have never cooked in this event and would like to, then please contact us for rules and other information. Hope to see you there.